Sign up for free and just shop with Levi's as normal. Our average member earns over $450 cashback a year. 30% off Sitewide. 30% off Sitewide. Only purchases made on Levi's's US site are eligible for cash back. Levi's has all kinds of clothing. You'll find trucker jackets, shirts, shoes and sweaters, but they're mostly known for their denim blue jeans. Popular pant styles include high rise skinny, shaping straight and slim and taper fit stretch. Find these awesome varieties in top collections like 501 Original and Vintage. Get 20% off and free shipping when you sign up for Levi's emails, and snag 15% off with a student discount. Save even more money with our Levi's coupons and cash back deals. The women's 501 denim skinny jeans are the epitome of cool. Constructed with a vintage design, you can tuck retro shirts into the high-rise waist. The tears by the knee are edgy but subtle. Throw on a baggy trucker jean jacket to complete your laid-back look. The oversize cut is great with shorts too, so you can wear it all year round. It looks especially cute with high waist pants and tight-fitting tops. And what about shirts for the kids? The girls' 7 - 16 high slit tunic is comfy and stylish. Made with incredibly soft fabric, it's snug like a sweater. It also has slits at the side for optimal flexibility. Moving on to men's apparel, the 501 original shrink-to-fit jeans are a classic pair of pants. They're made with genuine denim and cut super straight, so you can cuff the bottoms. Pair them with a trucker jacket and white tee, and you'll be the new James Dean. Save a ton with our Levi's promo codes. All you have to do is select the "Click to Reveal" button underneath an offer on our Levi's page, and then you'll be able to see the coupon. Once you have the code, you can apply it to items in your cart. Only one coupon can be used per purchase. Sign up for Levi's emails, and you'll get 20% off, free shipping and special offers. You'll also get the scoop on new clothing and access to exclusive events. 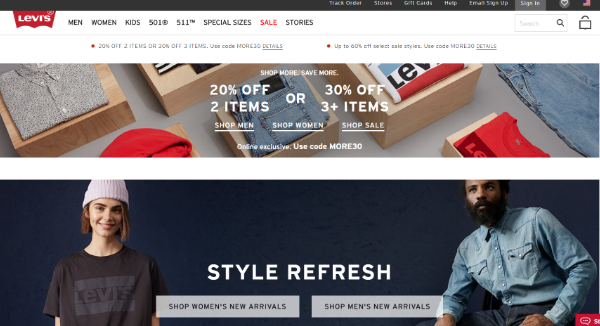 Check out Levi's Sale page for the latest deals. During the month of January 2018, they offered 20% off 2 items and 30% off 3 or more so you can expect unbeatable discounts like this in the future. If you're overwhelmed by the wide variety of great options, you can customize your search by selecting the fields under subcategories like Fit Number, Rise and Length. If you're a college student, you can get 15% off with a student discount. Just sign up with UNiDAYS and then verify your status. Levi's gift cards make the perfect present. You can send a physical one for free with standard shipping. Or you can email an e-gift card right away. Gift cards do not expire, but you cannot add value to them once they're used for purchase. When shopping online, you'll need to use the code. It's located on the back on the lower right-hand side. Just scratch off the grey material to see the PIN. When you're ready to finalize an order, enter the gift card number and PIN code in the relevant fields at checkout. Don't forget to hold onto your gift card while waiting for your delivery. You may need it if you run into any issues.